A report published today by Transport Focus in conjunction with HS2 Ltd has come up with several suggestions for the final operation of HS2, many of which show a complete detachment from reality. Members of the 40 strong focus group were chosen specifically because they had no knowledge of HS2 and were told to ‘disregard practicality’ when coming up with their ideas, which may well explain many of the outlandish and extravagant suggestions. One of the most reported suggestions from this report is to have gyms on HS2 trains, despite the fact it would seem there would be an inherent danger in using any piece of gym equipment on a train moving in excess of 200mph. Other suggestions which would surely eat into the number of seats on a train which we are told is needed for capacity reasons include; food which you can see being cooked, a waiter service, a GP surgery and pharmacy, shops, offices for business travellers, and family compartments. The focus group came up with the concept that windows on trains are vital. No really, this is serious. How much did HS2 Ltd pay for this crap? In what is surely a forlorn hope, the focus group suggested that HS2 should be made affordable, with one suggestion being to have standing carriages, which again seems rather impractical at 225mph. Supposedly innovative suggestions were to have porters for baggage, different classes of carriages, and seats which could face the way the train is going, an ‘innovation’ which was standard on trams 100 years ago. 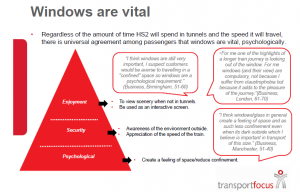 Potentially the least surprising demand from passengers in this ilk was that ‘windows are vital’, so it is recommended that these should be a standard feature on HS2 trains. To highlight the fact the members of the focus group didn’t know anything about HS2, one of the suggestions was that passengers should not have to walk more than a minute to connecting trains, despite that the Leeds, East Midlands and both Birmingham stations will be new builds requiring passengers to get to another station to continue their journeys. And how much did this pile of garbage cost the taxpayer? In fairness think the bit about Doctors was just a typo. What they really meant was GPS – to guide you to your seat – rather than GPs! Even so I can’t remember the last time I was left wandering around an Intercity Train trying to find my reserved seat. I have usually found that the Platform signs – “Carriage A stops here” to be more than adequate. Perhaps I’m missing the Brave New World that an App on my phone could deliver. You’ll have to excuse me – I need to go to my garden shed and can’t find my mobile to tell me where it is! How about office facilities, or are they provided by “customers” already? Maybe, HS2 Ltd. are trying to demonstrate a sense of humour, after all the whole project is risiblle, that Mr. Cameron, means it’s a mixture of ludicrousness and laughability. have been met by many residents who are so upset & angry at what may befall them, but does the “Govt” give a hoot?. HS2 would have been right at the top of Beeching’s list for scrapping. Gone off the rails long ago and about to drag the UK down the embankment from this gross spending spree cheered on by a out of control PM and a Chancellor looking for his next robe in Buckinghamshire. More like we will be road less and looking for a new Government in the next 2 years as votes of no confidence arrive. PM and the flock suffering from denial of the extent of issues facing over half the people in the UK from lack of money, mounting debts and terrible daily transport well off the HS2 corridor. The Titanic did not have the radar and the Government do not have the wisdom to address the every day matters first. I do not know what all the fuss is about…. This is most likely HS2 Ltd’s way of allowing pro-HS2 peeps to add the claim that HS2 will provide a cure for cancer to the ever growing list of things that it will solve!!! Like most of the output from HS2 Ltd, ludicrous!